The prospect of a short paddle from the Boat Passage to Manly lured Dave out of exile. On the ride to Blackbutt it was clear that he had mastered the bike. 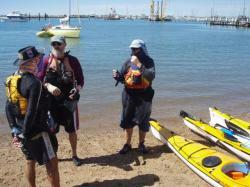 Now it was time for the sea kayak. Approach with caution as he is as feisty and determined as ever. Any unsolicited move to steady the boat might be met with a less than polite reaction. 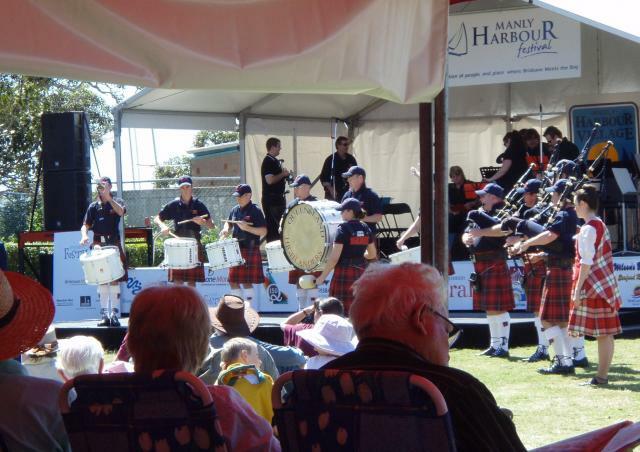 It was a gorgeous sunny day for the Manly Harbour Festival. 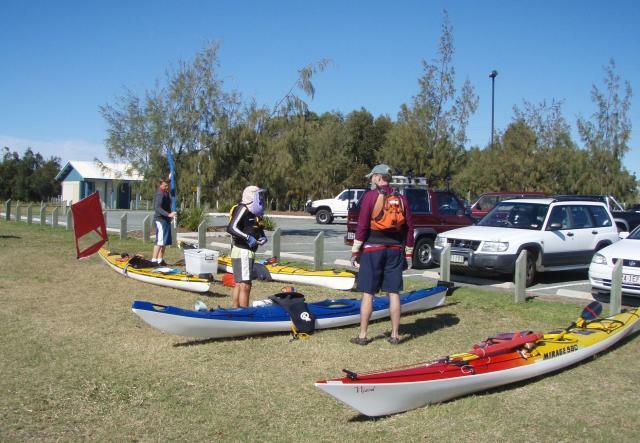 Held along the foreshore next to the Manly Boat Club, the area was sheltered from the prevailing southerly. The sound of a brass band drew us in through the stall holders to the central grassy common where we took up residence in the welcome shade of a large open sided marque. 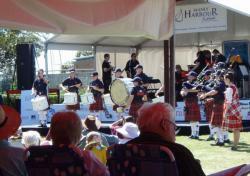 The Queensland Highland Band paraded in bringing with them a couple of dancers who gave an energetic performance. The slick Excelsior Band fronted up next, lead by an Irish conductor who was a consummate entertainer. Black and green striped marching girls with enormous fluffy hats were mulling around out the back, ready to go. When another black and green made a late dash across the common they took their cue and started to strut their stuff. Certainly looked like a way to keep fit and like all other performers they did well to smile in what was turning into a rather hot space. 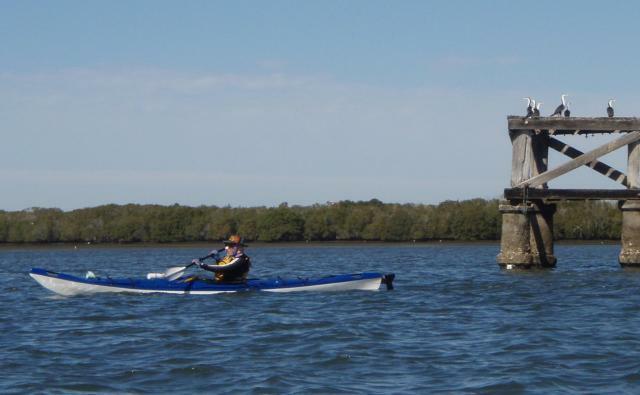 We kept an eye out for kayaks in the 3Km dash from Wynnum Creek to Rose Bay and came to the conclusion that it hadn't happened. 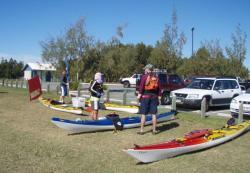 Turned out it had been and gone with around 40 kayaks rocking up - just all a bit too quick for our style. 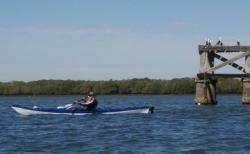 By now the wind had swung around to the NE and there was a small chop from wind against tide. An occasional turtle and stingray were seen in the muddy shallows. What was impressive was the several hundred strong bevy of black swans as they took flight enmasse. 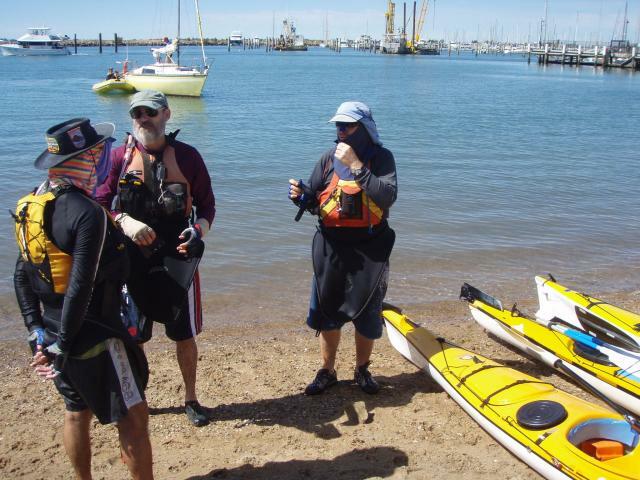 By the time we pulled up Dave said he was feeling the lack of paddling and glad to see the shore, but he is back and I think we will soon be seeing more of him on the water.